Online file locker services that, like Rapidshare, have a business model that provides an incentive to share copyright protected materials must monitor incoming links to discover infringing files, the German Federal Court of Justice has ruled. The ruling concerned a dispute between German copyright collecting society Gema and filesharing site Rapidshare. In 2009, Gema sued Rapidshare in Germany, alleging that over 4,800 music files for which it represented the copyright holders were shared via Rapidshare without consent from Gema or the artist. Gema won the case in lower courts and on Tuesday the German federal court published its decision confirming those rulings. The decision was made on Aug. 15, but German courts typically take several weeks to process full written verdicts. Rapidshare itself estimates that it has an abuse rate of 5 to 6 percent which corresponds to approximately 30,000 infringing acts with a daily upload volume of 500,000 files. 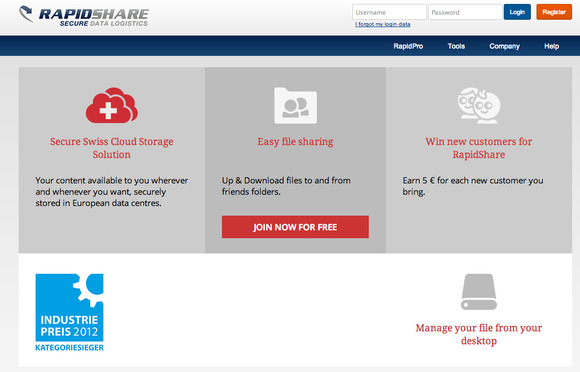 The federal court said that while Rapidshare’s business model was not designed for rights violations from the outset, it provides an incentive for sharing illegal downloads. Unlike other cloud computing services, the defendant doesn’t require a fee for storage space, the court said. Revenue is made by selling premium accounts that are mostly attractive for massive illegal downloads, it said. This attractiveness for illegal use is enhanced by the opportunity to get an anonymous account, it said, adding that Rapidshare itself estimates that it has an abuse rate of 5 to 6 percent which corresponds to approximately 30,000 infringing acts with a daily upload volume of 500,000 files. Because Rapidshare provides an incentive to share illegal downloads, it is obliged to monitor if there are indications that there are such files available on its platform, said court spokeswoman Dietlind Weinland on Wednesday. Therefore, Rapidshare has to monitor incoming links with all possible resources such as search engines, Facebook, Twitter or web crawlers if necessary, the court ruled. “How they do that precisely really doesn’t matter to us,” she said, adding that the main point is that Rapidshare has to monitor regularly and comprehensively. While this verdict concerns Rapidshare it also applies to file hosting services with a similar business model, Weinland said. In this verdict, the Federal Court of Justice broadened the liability of file locker services, she said. In a similar copyright dispute between Atari and Rapidshare before the federal court, the file locker service deleted an illegal copy of the game “Alone in the Dark” at Atari’s request, but neglected to check whether the game was stored on its servers by other users. The court ruled in June last year that Rapidshare should check its servers for other infringing material. However, that dispute dealt with one single issue and the court didn’t conclude that the Rapidshare’s business model provides an incentive for copyright infringements, Weinland said. Gema called the verdict “groundbreaking” because it clarifies that online storage services are fundamentally responsible to rights holders whose works are illegally shared on a massive scale, it said in a news release dated August 16. Rapidshare did not immediately respond to a request for comment. The service however changed its business model in November 2012 when it announced it would adopt a classic hosting model, meaning that not only the storage space but also the traffic created would have to be paid for solely by the uploader of the file. While RapidPro accounts still come with unlimited traffic for a user’s own downloads and downloads by contacts of that user, public traffic was capped at 30 GB per day. This made Rapidshare unattractive for those seeking to share copyright materials without permission. The current ruling though might pose an extremely complex undertaking for services like Rapidshare, wrote Thomas Stadler, a German lawyer specializing in IT and intellectual property, in a blog post on Wednesday. The services can only minimize but not exclude liability risks by monitoring incoming links, he wrote. “It is therefore quite possible that this will mean the end for services like Rapidshare in Germany in the short or medium term,” he wrote.